I am so grateful that I was able to be a part of Crystal Stine’s book launch for Holy Hustle. This book was released on June 5, 2018 – the same day that I am dating this review. (Note: I did get a free download of the book. There is also an affiliate link included below in case you want to help me keep writing book reviews.) She is such a positive person who truly seeks after Jesus. I am thankful that she shared her perspective with all of us. 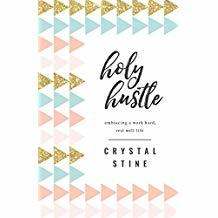 When I first heard the topic of Crystal Stine’s upcoming book, Holy Hustle, I knew that I must read it. Any author that was brave enough to address the somewhat controversial topic of work vs. rest in the Christian realm was worth reading. Too many times Christian (women especially) who feel motivated to work can feel like they are somehow overstepping boundaries. As a work-from-home mom, I know that I have felt that way at times. Like maybe I should only focus on my family. And I like that thought. But at the same time, I know that my bit of contributing income helps to ease a bit of financial pressure. What I appreciate about this book is the fact that her focus is not only on work. Instead she focuses on how we can approach the whole work life balance concept. In order for us to be healthy, we also need to rest. Ultimately we need to pursue God’s calling on our lives. I think chapter five was my favorite because I appreciated the reminder that there is a reward for working hard for God’s glory. I highly recommend this book to anyone. The particular audience is women though, and I appreciate that each chapter included a testimonial from a woman on the perspective of Christian work and rest. Holy Hustle is a book that I will read again and again. To purchase Holy Hustle using my affiliate link, please order using the link below.